I have to admit, I really can't resist a sight-gag. So when my dad recounted the shock of unfurling the morning paper, I fell about laughing. 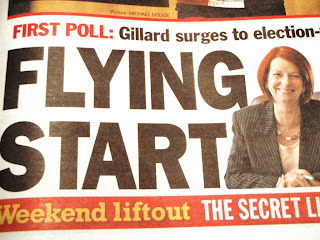 Remember folks: always unroll the whole newspaper before reading the headline about the new Prime Minister. Excellent! Isn't the English language just special?? You crack me up again woman! Oh my, I was reeling with shock trying to work out which media outlet I was about to complain to...when I read the rest of your post. Hilarious! I just sprayed coffee across the keyboard - classic! What a hoot! That's just brilliant. You're the best, no serious political statements, just replaying bad Dad jokes...we love it! Omg Liesl that is fan-frikkin-tastic! LOL. Thanks for sharing that! So that pulling-the-one-from-left-field thing, is genetic then. Snigger. Love it, there is nothing like a smile to start your day. 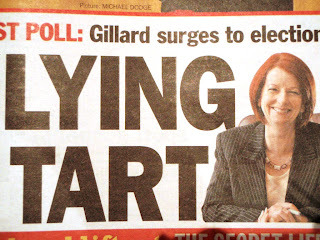 Not a sight gag but my dad reported that his Queensland paper's headline yesterday was Julia Seizer. I sincerely hope your first lady PM is a LOT better for your country than ours was. Ok, she couldn't be worse, but still! ahhh that is brilliant! Even the hubby chuckled loudly (grin). i'm at work and me and my newspaper colleagues here this evening find that rather hilarious! Fabulous! Oh, someone has *got* to have done that on purpose, surely! Someone has probably been biding their time, waiting to pinch that one! That IS funny. Childish, yes. But really funny. Thanks for the laugh! Justin and I have been guffawing for a good few minutes now over that. lol Thanks for the belly laugh. Love it! was about to be all out raged and stuff but who doesn't love a sight gag! That's so funny I nearly popped out a baby! I hadn't seen that one. Brilliant!!! !